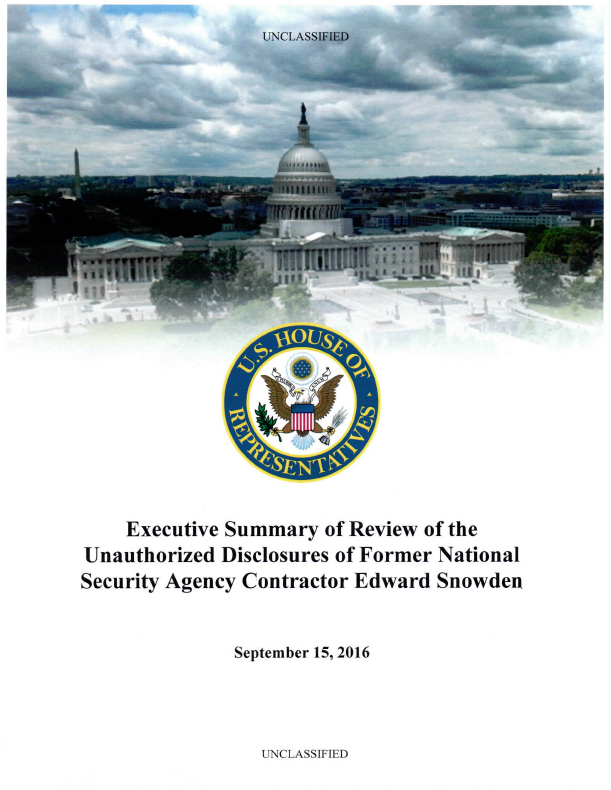 Over the next two years, Committee staff requested hundreds of documents from the Intelligence Community (IC), participated in dozens of briefings and meetings with IC personnel, conducted several interviews with key individuals with knowledge of Snowden’s background and actions, and traveled to NSA Hawaii to visit Snowden’s last two work locations. The review focused on Snowden’s background, how he was able to remove more than 1.5 million classified documents from secure NSA networks, what the 1.5 million documents contained, and the damage their removal caused to national security. The Committee,s review was careful not to disturb any criminal investigation or future prosecution of Snowden, who has remained in Russia since he fled there on June 23, 2013. Accordingly) the Committee did not interview individuals whom the Department of Justice identified as possible witnesses at Snowden’s trial, including Snowden himself, nor did the Committee request any matters that may have occurred before a grand jury. Instead, the IC provided the Committee with access to other individuals who possessed substantively similar knowledge as the possible witnesses. Similarly, rather than interview Snowden’s NSA coworkers and supervisors directly, Committee staff interviewed IC personnel who had reviewed reports of interviews with Snowden’s co-workers and supervisors. The Committee remains hopeful that Snowden will return to the United States to face justice. The bulk of the Committee’s 36-page review, which includes 230 footnotes, must remain classified to avoid causing further harm to national security; however, the Committee has made a number of unclassified findings. These findings demonstrate that the public narrative popularized by Snowden and his allies is rife with falsehoods, exaggerations, and crucial omissions, a pattern that began before he stole 1.5 million sensitive documents. First, Snowden caused tremendous damage to national security, and the vast majority of the documents he stole have nothing to do with programs impacting individual privacy interests-they instead pertain to military, defense? and intelligence programs of great interest to America,s adversaries. A review of the materials Snowden compromised makes clear that he handed over secrets that protect American troops overseas and secrets that provide vital defenses against terrorists and nation-states. Some of Snowden’s disclosures exacerbated and accelerated existing trends that diminished the IC’s capabilities to collect against legitimate foreign intelligence targets, while others resulted in the loss of intelligence streams that had saved American lives. Snowden insists he has not shared the full cache of 1.5 million classified documents with anyone; however, in June 2016, the deputy chairman of the Russian parliaments defense and security committee publicly conceded that “Snowden did share intelligence” with his government. Additionally, although Snowden’s professed objective may have been to inform the general public, the information he released is also available to Russian, Chinese, Iranian, and North Korean govemment intelligence services; any terrorist with Internet access; and many others who wish to do harm to the United States.